For other uses, see Compass (disambiguation). A compass (or mariner's compass) is a navigational instrument for finding directions on the earth. It consists of a magnetized pointer free to align itself accurately with Earth's magnetic field, which is of great assistance in navigation. The cardinal points are north, south, east and west. 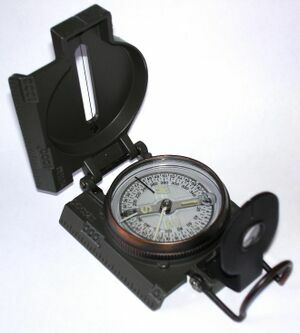 A compass can be used in conjunction with a chronometer and a sextant to provide a very accurate navigation capability. 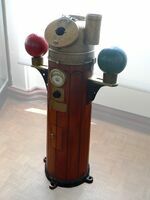 This device greatly improved maritime trade by making travel safer and more efficient. 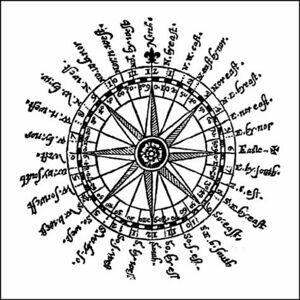 An early form of compass was invented in China in the 11th century. The familiar mariner's compass was invented in Europe around 1300. More technically, a compass is a magnetic device using a needle to indicate the direction of the magnetic north of a planet's magnetosphere. Any instrument with a magnetized bar or needle turning freely upon a pivot and pointing in a northerly and southerly direction can be considered a compass. A compass dial is a small pocket compass with a sundial. A variation compass is a specific instrument of a delicate type of construction. It is used by observing variations of the needle. A gyrocompass or astrocompass can also be used to ascertain True north. Prior to the introduction of the compass, direction at sea was primarily determined by the position of celestial bodies. Navigation was supplemented in some places by the use of soundings. Difficulties arose where the sea was too deep for soundings and conditions were continually overcast or foggy. Thus the compass was not of the same utility everywhere. For example, the Arabs could generally rely on clear skies in navigating the Persian Gulf and the Indian Ocean (as well as the predictable nature of the monsoons). This may explain in part their relatively late adoption of the compass. Mariners in the relatively shallow Baltic made extensive use of soundings. The earliest Chinese literary reference to magnetism lies in a 4th century BC book called Book of the Devil Valley Master (鬼谷子): "The lodestone makes iron come or it attracts it." The first mention of the magnetic attraction of a needle is to be found in a Chinese work composed between 20 and 100 AD (Louen-heng): "A lodestone attracts a needle." In 1948, the scholar Wang Tchen-touo tentatively constructed a 'compass' in the form of south-indicating spoon on the basis of this text. However, it should be noted that "there is no explicit mention of a magnet in the Louen-heng" and that "beforehand it needs to assume some hypotheses to arrive at such a conclusion". The earliest reference to a magnetic device as a direction finder is recorded in a Song dynasty book dated to 1040-44. Here we find a description of an iron "south-pointing fish" floating in a bowl of water, aligning itself to the south. The device is recommended as a means of orientation "in the obscurity of the night." There is, however, no mention of a use for navigation, nor how the fish was magnetized. The earliest recorded actual use of a magnetized needle for navigational purposes then is to be found in Zhu Yu's book Pingzhou Table Talks (Pingzhou Ke Tan) of AD 1117: The navigator knows the geography, he watches the stars at night, watches the sun at day; when it is dark and cloudy, he watches the compass. The temporal priority of the Chinese navigational compass (1117) as opposed to the European (1190). In the Mediterranean the practice from ancient times had been to curtail sea travel between October and April, due in part to the lack of dependable clear skies during the Mediterranean winter (and much of the sea is too deep for soundings). With improvements in dead reckoning methods, and the development of better charts, this changed during the second half of the 13th century. By around 1290 the sailing season could start in late January or February, and end in December. The additional few months were of considerable economic importance; it enabled Venetian convoys, for instance, to make two round trips a year to the eastern Mediterranean, instead of one. In 1936 Tuomas Vohlonen invented the first successful portable liquid-filled compass designed for individual use. At sea, a ship's compass must also be corrected for errors, called deviation, caused by iron and steel in its structure and equipment. The ship is swung, that is rotated about a fixed point while its heading is noted by alignment with fixed points on the shore. A compass deviation card is prepared so that the navigator can convert between compass and magnetic headings. The compass can be corrected in three ways. First the lubber line can be adjusted so that it is aligned with the direction in which the ship travels, then the effects of permanent magnets can be corrected for by small magnets fitted within the case of the compass. The effect of ferromagnetic materials in the compass's environment can be corrected by two iron balls mounted on either side of the compass binacle. The coefficient <math>a_0</math> representing the error in the lubber line, while <math>a_1,b_1</math> the ferromagnetic effects and <math>a_2,b_2</math> the non-ferromagnetic component. This method is sometimes known as the Silva 1-2-3 System, after Silva Compass, manufacturers of the first protractor compasses. Originally, many compasses were marked only as to the direction of magnetic north, or to the four cardinal points (north, south, east, west). Later, mariners divided the compass card into thirty-two equally spaced points divided from the cardinal points. For a table of the thirty-two points, see compass points. Most military defense forces have adopted the 'mil' system, in which the compass dial is spaced into 6400 units (some nations use 6000) or 'mils' for additional precision when measuring angles, laying artillery, etc. Admiralty manual of navigation, Chapter XXV The Magnetic Compass (continued) the analysis and correction of the deviation, His Majesty's Stationary Office, London, 1914. Alan Gurney, Compass: A Story of Exploration and Innovation, W.W. Norton & Company, 2004, ISBN 0-393-32713-2. Amir Aczel, The Riddle of the Compass: The Invention that Changed the World, ISBN 0-15-600753-3. Frances and Joseph Gies, Cathedral, Forge, and Waterwheel subtitled "Technology and Invention in the Middle Ages"
Frederic C. Lane, “The Economic Meaning of the Invention of the Compass,” The American Historical Review, Vol. 68, No. 3. (Apr., 1963), pp. 605-617. Joseph Needham, Colin A. Ronan: The Shorter Science & Civilisation in China Vol 3 Chapter 1 Magnetism and Electricity. Li Shu-hua, “Origine de la Boussole 11. Aimant et Boussole,” Isis, Vol. 45, No. 2. (Jul., 1954), pp. 175-196. This page was last edited on 20 October 2016, at 23:58.